These materials are all geared toward elementary education in language arts. 100 Writing Prompts makes your creative writing process easier by offering a variety of authentic writing situations. Students can pull in personal experiences and prior knowledge to write about topics that interest them. 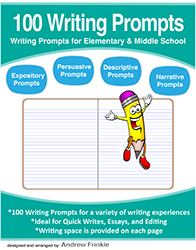 100 Writing Prompts includes prompts appropriate for students in elementary and middle school grades. 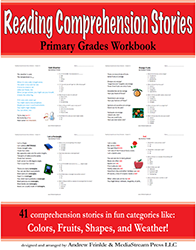 Each page has a title, a prompt, and writing space for a rough draft or quick write. Also included are 5 different activities to help you add fun to your writing challenges. 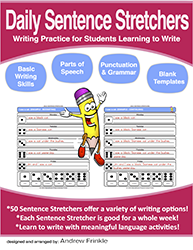 Daily Sentence Stretchers makes your daily writing process easier by offering a variety of meaningful writing activities. Students take a basic sentence and stretch it out with their own creativity. Roll a 6-sided die, read the directions from the matching number in the key, and then modify the basic sentence! Repeat every day for a week to get a great writing experience! Daily Sentence Stretchers is great for homework, bell-ringers, extra work for those fast students, or just as a literacy center! 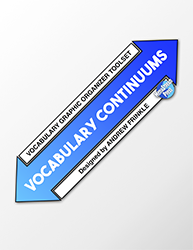 Use any of the 25 basic sentence pages or the 25 advanced sentence pages for students in grades K and up! This set features over 300 Words on cards! This set features over 300 Words on dice! 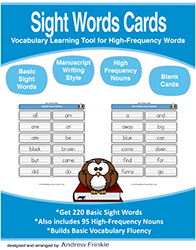 This book helps with spelling and vocabulary, as well as phonics. 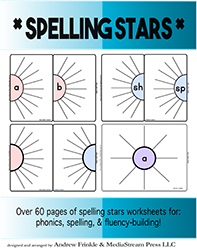 Collect words onto the starburst graphic organizers according to the letters, clusters, and digraphs or blends. Get my NEW freshly redone creative writing tools all in one printable volume! This contains all of my previous sets of cards, many with edits and fixes. They have also been reworked in a paper-saving smaller format. You now get 9-15 per page instead of 4. That really helps when you print 1200 cards! Great Starts Cards offer a title and some hints on how to get started. 5 activities are included for using them. Story Starters Cards offer genre-specific items, characters, plots, and settings along with 10 activities to help you make your own stories from THOUSANDS of combinations. This is a graphic organizer toolset used to show different shades of meanings in a similar set of words. No more plain antonyms and synonyms. Now you can show the connections between different words with relative connections to each other. Get a whole year's worth of sentence strips already made in this book! 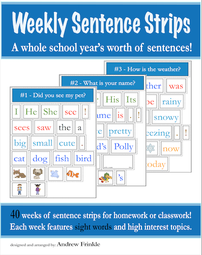 40 weeks of sentences for classwork or homework. 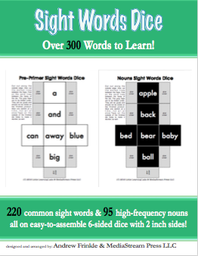 Plus extra worksheets, forms, and 150+ REBUS pictures! Using all the parts of speech! This set features over 225 unique tiles, as well as capital letters and extra copies of each lower-case letter. You will not find a more complete set to make words with!